Tidel’s revolutionary Sentinel™ Cash Management System has set the standard for cash control while interfacing with POS devices and many other peripherals such as cash recyclers and bill validators. The Sentinel BCD builds on this by offering bulk coin dispensing in any quantity. Coins are dispensed into individual cups. Courier time spent in-store is dramatically reduced through a convenient loading system that accepts loose coins. 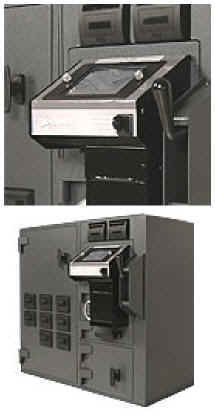 The coin dispensing system can then dispense variable amounts of presorted coins at the touch of a button. Each coin is counted and accounted for by individual cashiers using the PIN based touchscreen system. The Sentinel BCD must be connected to an isolated power circuit or Tidel approved surge suppressor. An isolated circuit must consist of a LEAD, NEUTRAL and GROUND, connected directly to the power distribution panel and cannot share the same conduit as other equipment. The socket/outlet should be installed near the equipment and should be easily accessible.